On the day it was created, the clouds parted and a golden chalice of candy descended from the heavens. 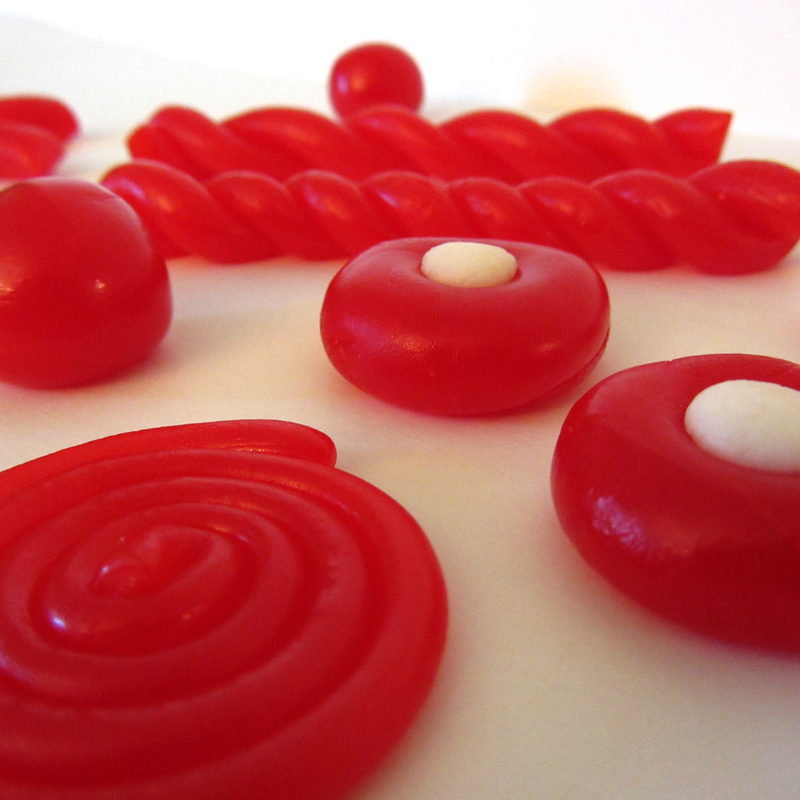 Red Licorice. My holy grail. My Atlantis. I have long yearned to unveil its mysteries. It is rare that I give a food so much of my attention. I have pored through books, researched, scoured the internet, tried innumerable recipes. All of my labors seemed for not - batch after failing batch. Just when it seemed that no real information was available, that this delectable confection was limited to commercial production, the pieces of the puzzle finally...slipped...together. This is my own recipe, based on the mass of little factoids that I've uncovered over time. I will say that the most important key was discovered at Wikipedia. I am most grateful. Why, you might ask, would anyone want to make their own licorice? When you can just pop into the store, pick up some Red Vines, and have instant gratification? Well, there were two reasons for me, I suppose. First, red licorice was a challenge. I have tackled and conquered most of my other favorite candies; red licorice stood undefeated. I was laid down in the dust with its red boot on my chest, it's sticky arms raised in triumph. I had to save my good name. Hmmm...too far perhaps. Anyway, the second reason is bragging rights. There's just something special about saying, "I made it myself!" It must be said that this recipe is not Red Vines. It is good, though. Really good. The texture is just slightly off, but I think that can be attributed to the candy not being handled by machines and not being molded as it is commercially. This is as close as I think I'm going to get with homemade, so I count it as a win! 1. Make ready a large piece of parchment paper. Set aside. 2. In a medium heavy-bottomed saucepan, whisk together the sugar, cornstarch, and salt (to prevent clumping). Whisk in the corn syrup, oil, and water. Set over medium-high heat. Bring to a boil, stirring constantly (a silicon spatula works well here). 3. Reduce the heat to medium-low. Cook, stirring occasionally, until it reaches 260° (hard ball stage). Remove the pan from the heat. 4. Stir in the flavorings and color. 5. Pour the mixture onto the prepared parchment paper. Let rest until cool enough to handle. 6. Take about 1/4 of the candy. You can roll and cut the licorice into any shape you'd like. 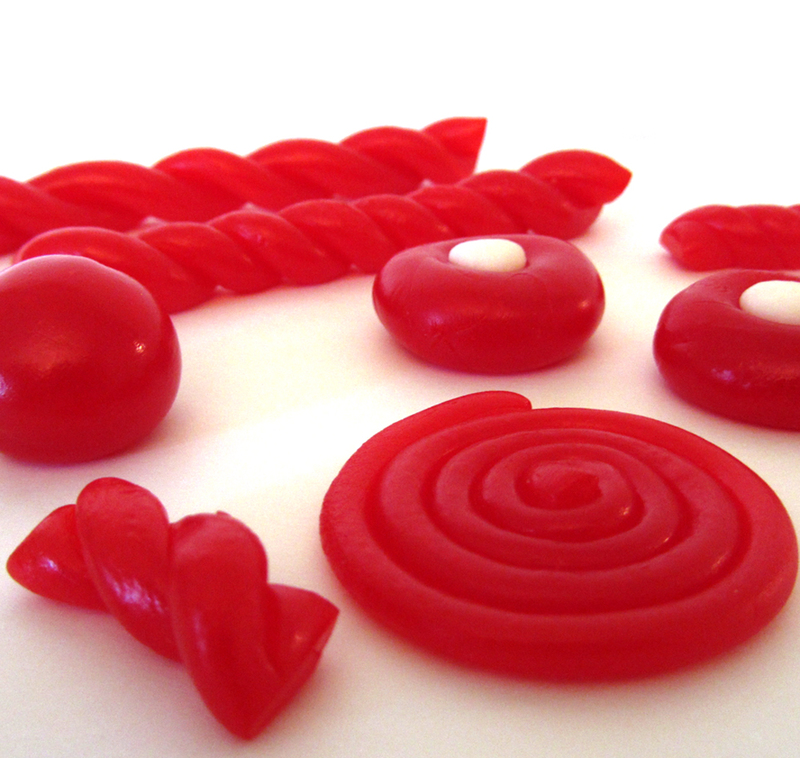 The easiest is chews: Roll the section of candy into a 1/2" diameter rope. Place the rope on the parchment paper. Snip into 1" lengths with kitchen shears. Repeat with the remaining candy. If candy becomes too hard to shape, you can put it in the microwave for a few seconds. 7. Cover the candy and store in a cool, dry place. 1. You might notice that Red Vines and Twizzlers are tube-shaped. That's because licorice is super chewy. Of course, if you work quickly, and keep the candy warm, you can make the tubes yourself (a lot of work). Alternately, you can roll the candy flat and then cut it into pieces. Not as pretty, but easier on the teeth! 2. You can make black licorice by using licorice or anise extract and black coloring. 3. In the photo, you'll notice a couple of creme filled candies. This turned out to not be the best application - the licorice is just too chewy. If you cook the candy only to firm ball stage, though, the creme filling is a lot more at home. I found the filling recipe, by Andrew Mollman, at Food.com. Awesome! Thanks for the recipe. Worked great and my kids love it. We used a koolaid powder packet instead of the flavor and color, so it came out a little tart, but very yummy nonetheless. Thanks for sharing your secret!!!! I'm so glad that you gave it a try and like the results - I'm honored to share! Happy eating!! Hi! I just found your blog searching for a licorice recipe, and I love it! You cooked it to too high a temp. Don't forget to adjust for altitude. Here at 6000 feet i have to shave almost 10 degrees off of recipes. I'm the anonymous from Feb 1. I made a batch of this, cooked to 252 (I'm 6000 feet), used a full dram of LorAnn Cherry, 1 tsp of citric acid. The flavor is fantastic, the chewiness is perfect. Initially I didn't like the texture, I could taste the grain-iness of the corn starch...but after a couple days that's gone and I really really like it! I think there's something to "curing" it for a couple days. I cut in strips and rolled in parchment...strips not touching other strips (or they stick). Thanks for the recipe. Thank yo so much for the recipe. I have been looking for a recipe for red licorice for years and have never found one until now. My daughter has celiac disease so she has never tried licorice because they all contain wheat flour. Now I have the recipe and it is gluten free as well. Yeah!!! I have been working with your recipe for a few months and have perfected it with the exchange of one ingredient. Modified corn starch instead of regular corn starch. You can find it on Amazon under the name "Sure Jel"...be sure to NOT use the instant version. Now it's perfect!!! perfect texture, no graininess. I will give it a go with the modified corn starch! Thanks for the tip - can't wait to try it! I will have to try this, but I must say as a fellow licorice lover, if you haven't met kookaburra licorice, you're totally missing out. I wonder if the perfected form of this tastes like that. Get some today! When you say strawberry and cherry flavoring, is that like extract? Or something else? I have been trying to make licorice for quite some time and can relate to you with the "holy grail" analogy. What kind of licorice is this texture closest to? I am going for a chewy Australian style. Also, any additional tips for this recipe you have developed over the the past few years? Thanks! First off I want to thank you for this wonderful post. I have been trying to find a good recipe for homemade licorice, so YAY! Well I tried it and the flavor is great, the texture I wasn't so successful with, it came out as a hard candy. I am cooking at slightly above sea level, so I think I might need to bring the temp down a bit from the 260 you have in the recipe. Has anybody else had this issue? Anyhow, I will keep trying, I think this is the recipe I have been looking for. Thanks again. Tried this and at sea level. Hard candy. Do i adjst temp down? Thanks for any input! Also, did the modified corn starch idea work out better? Same? Worse? Hoping for a great turn out! I love that you have a licorice recipe! This is my mom and I's favorite type of candy. But if you use the Sure-Jell in place of the cornstarch how much do you use? BTW I'm really excited to try this recipe! How much Sure-Jell do you use? Also is this the same stuff that I use for canning fruits? Thank you. this just DID NOT WORK. my turned into this weird blob and stuck to the pot. as a professional chef i was VERY irritated. I kept it cooking for 15 mins on the heat and it NEVER got past 190*f. WTF did I do wrong? I found your recipe even for a professiona bit vague. i brought it to a boil but the cornstart congealed and then it proceeded to get a hard film on the bottom of the pot and stay that way.